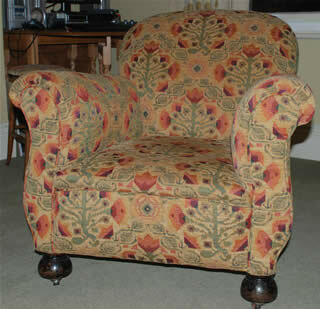 Thank you for a really super weekend of upholstery and for your great food and hospitality. We really enjoyed ourselves. I learned far more than would be possible from text books. 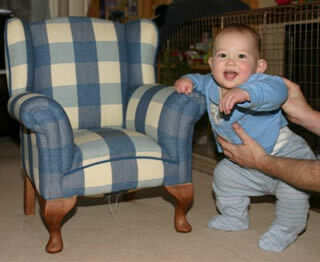 I've ordered a set of tools online with the aim of completing my chair when I return from the paralympics in London. I feel very inspired to do more and I have my next project lined up. Thank you again for a fantastic course. Email from a day class student in February 2012. Thank you so much for Saturday's class. I really enjoyed it and learnt so much. 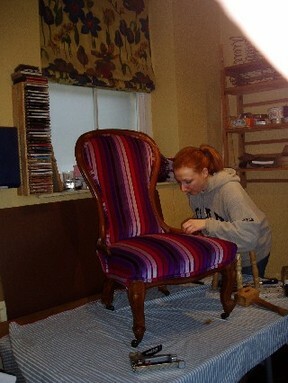 Only problem is I feel I should redo all the curtains I have made so far and start again! Just finished the first term of year 2 soft furnishings course - I received a commendation award for my year 1 work which was a real surprise! Part way through my first two pairs of curtains for a paying customer - amazing! Hope all the courses are going well - I check in with your website every now and then to remind myself where it all started. Hope all is well and the vegetables are still thriving. Just a quick note to say another huge thank you for such a wonderful, inspiring 4 days! I can't tell you how much I enjoyed the course and your hospitality, fantastic food - and those views - all made the experience a perfect combination of learning and "therapy"! 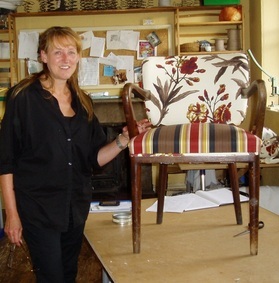 ................I have taken so much away from the course to give me the confidence to go on and it is my aim to move away from curtains and into upholstery. Hi Angie, I just wanted to send a quick email to say a huge thank you for the fantastic course this weekend. I enjoyed it so much, learn so much and thoroughly enjoyed your company and teaching methods. You have a beautiful home and I thought you and your families lifestyle seemed idyllic, and certainly something to admire. I am now back in London, extremely busy at work but a 4 day break in beautiful surroundings was definitely a welcome break! ......... A friend of mines Mum is also keen to do the course and I highly recommended you. 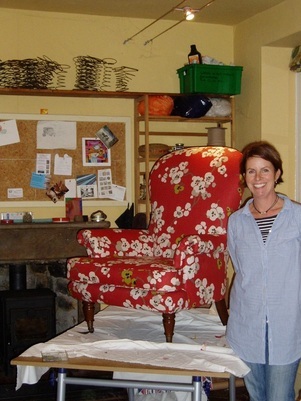 Comment from August 2009 from a lady who came to make furnishings for canal boats and lived on one herself. I had such a fantastic time in August with you all - I was absolutely full of it when I came home and bored everyone showing them what I had made........it just went to quickly and I would so love to come again one day.....hope everything is going well and I think of that fantastic view looking through your workroom window. Still on a high from weekend. You have an excellent setup and your home if very cosy and relaxing, not to mention the excellent food. Thank you for such a brilliant long weekend. I have been racking my brains for some 'constructive criticism' about the course but I can honestly say that it was perfect in every respect! The small group size made it possible to crack on with my project without having to wait for advice, the workshop environment was excellent and the hospitality, company and catering, truly superb....I can't wait to come back in June. Dear Angie, A heart-felt thank you for a wonderful day yesterday. It was bliss! I thoroughly enjoyed being on the receiving end of a course for a change - especially with you excellent tuition, warm hospitality and delightful surroundings. 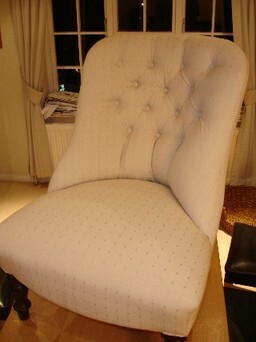 My chair can now look forward to a new lease of life and will continue. This student completed an astonishing 4 pairs of interlined curtains and an interlined roman blind in five and a half days (plus a lot of very late hours in the evening)! Thank you so much for all the help you gave me on the course last week. The "one to one" tuition was invaluable, can't believe I learnt so much. The curtains and roman blind are already hanging and all look wonderful - if I say so myself! Considering how much we got through I feel completely rested and rejuvenated - peace, quiet, all that wonderful organic food, home hade honey, not to mention the biscuits, muesli and Carl's cherry brandy! Thank you again. Have already a plan for a revisit in early Autumn if you can fit me in. A letter from three sisters who came to stay twice in 2004. Just a little note to tell you how much we enjoyed your course. We returned home full of how much we had learnt in such a short space of time. The blue chair was highly praised by my friends (which is very satisfying) and has now been taken to Brunswick Bay for pride of place in their cottage. Angie, you inspired us all, both you and Carl worked so hard during our visit to make sure everything went smoothly. We all thoroughly enjoyed your company. The meal times were great fun, the odd glass of wine helped I am sure. You have got the formula right so I am sure your venture will be a resounding success. I just hope you will be able to fit us in later in the year for "arm and deep buttoning". Many thanks and give our love to the lovely Gabriel.